The ROAR of Jacksonville have posted bios and photos of their new squad. Michelle is a four-year veteran member of The ROAR. She graduated from the University of Georgia with a B.S. in Ed./Sports Communications. She is nutrition product distributor. Michelle has 6 years of dance training and received a performing arts scholarship in college. This is probably the last post we’ll ever do on the Tampa Bay Lightning Girls. But don’t despair, its only because the Lightning Girls are combining with the Energy Team to form the all new co-ed Bolt Brigade. 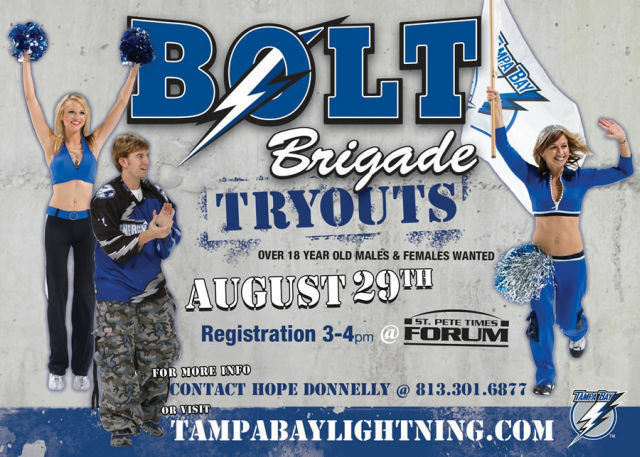 The Lightning Girls are combining with the Energy Team to form the all new co-ed Bolt Brigade. Auditions are Sunday, August 29th, and there are still 4 prep classes left to attend. The Southern Indoor Football League have announced their post season awards and the Austin Turfcats Dance Team were named the league’s Best Cheerleader/Dance Team. 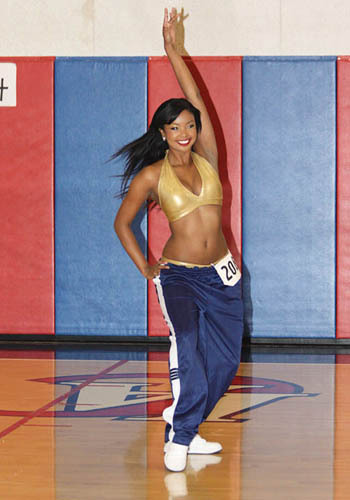 Michelle spent two years at Kilgore College where she was a member of the world famous Kilgore College Rangerettes. While with the Rangerettes her performances include the Macy’s Thanksgiving Day Parade in New York City, the second inauguration of President George W. Bush in Washington D.C., several halftime performances at Dallas Cowboys games and halftime performances at the Cotton Bowl. After attending Kilgore College, Michelle went on to finish her college career at Texas State University where she earned her degree in Psychology. 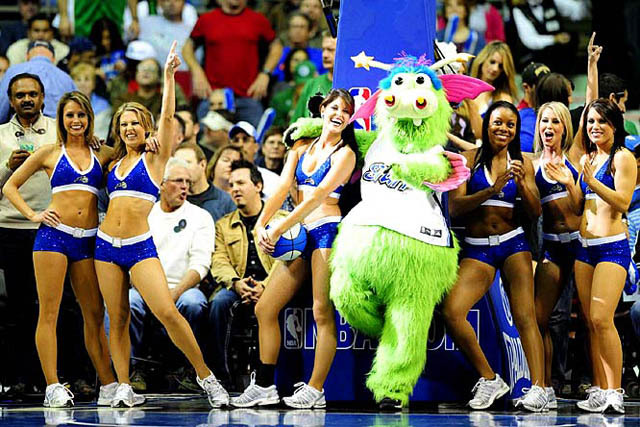 Michelle spent two years cheering and dancing for the Austin Wranglers of the Arena Football League. Her second year she was honored to also direct the team and choreograph routines for the cheerleaders. Silver Dancer auditions begin this weekend, but the final squad won’t be chosen until Tuesday, August 4 during the free Silver Dancer Finals event at Cowboys Dance Hall located at 3030 NE Loop 410 from 7:00-9:30 p.m.
Silver Dancer Finals are FREE and open to fans of all ages, with food and beverage available throughout the evening. Doors open at 6 p.m. and fans are encouraged to join the Spurs in cheering on their favorite Silver Dancer candidate as the final 16-member squad is chosen and announced live at Cowboys Dance Hall. Coyote, the Spurs Championship trophies and the Spurs RV will be on site to add to the fun, and help announce the 2009-10 Spurs Silver Dancers team. Fans in attendance will also have the exclusive opportunity to meet and get autographs from the 2009-10 Silver Dancers. Thirty five finalists took to the stage at the Winningstad Theater in Portland’s Center for the Performing Arts for the final round of auditions to determine which 16 ladies would grace the Rose Garden floor as BlazersDancers during the 2009-2010 Trail Blazers season. Hundreds of family members and friends packed the theater to support the dancers and were treated to a fantastic show. Comcast SportsNet was also on hand again this year to record the auditions for a reality TV show set to air this fall, adding to the excitement for both the dancers and their fans. The dancers came prepared to perform the two group routines that they had learned the previous weekend along with a solo routine. However, when the dancers arrived they were surprised with an additional dance to perform and only one hour to prepare for it. Luckily, this was a free-style “hot time-out” dance that didn’t require any choreography, but instead was meant to test the dancers’ ability to have fun and play to the crowd. Once the show was underway, the finalists danced their hearts out for an expert panel of judges and an enthusiastic crowd. Four routines and five hours later, the auditions were over and the dancers could breathe a sigh of relief. But now came the toughest part of the audition process for the dancers, waiting until the following day to find out the results. The next afternoon, when the dancers arrived at the Rose Garden they were anxious, nervous and excited to find out if they had captured one of the 16 spots on the team. Each dancer was led one by one into the Trail Blazers locker room where they found a locker with their name on it covered by a curtain. Behind the curtain they would find either a BlazerDancer uniform – meaning they made the 2009-2010 BlazerDancers, or an empty locker – meaning their quest to become one of the final 16 was over, at least for this year. For some, the wait was well worth it, for others the day ended in disappointment. The lucky 16 who found uniforms in their lockers greeted each other with excited screams, hugs and tears. This season’s team has familiar faces with eleven returning dancers and two dancers who were on the team in previous years, as well as three rookies. The Trail Blazers are happy and proud to introduce you to a group of young women the fans will come to know very well. Click here to find everything you need to know on OrlandoMagic.com. And although my favorite Magic Dancer, the supremely cool and talented Miss. Megan Clementi, has retired (moment of silence, please…), the silver lining is that leaves one more pair of empty go-go boots on the squad. Just think – at next year’s playoffs, YOU could be the one dangling precariously from the ceiling in pointy-toed boots! Personally, I would pay money for that experience. Congratulations 2009-10 Los Angeles Clippers Spirit Dancers! 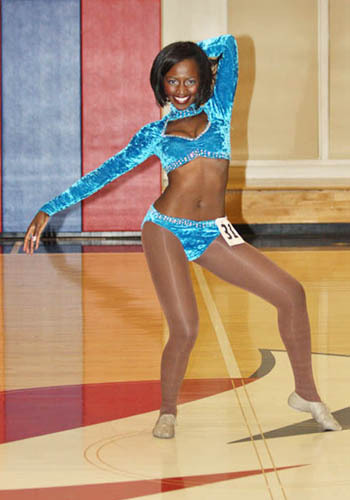 On Tuesday night, 28 young women threw their hearts into it as they auditioned for the 2009-10 Clippers Spirit. They did a jazz routine choreographed by Cheryl, Asst. Director/choroegrapher. Director C. They did an insanely fast hip-hop routine. They did solos. Then they did them all over again. They gave it all they had. DeAndre Jordan seemed to have a tough time with it. (Luckily his new pal Blake Griffin, this year’s #1 NBA draft pick, who just joined the Clippers, was on hand to offer an opinion or two.) Here are the judges. Gee, I wonder which two are DeAndre and Blake? The judges took their time considering the candidates, while the dancers sweated it out. This morning, Clippers Spirit Director Audrea Harris announced the 16 ladies who would join the team this year. All ten veterans who auditioned, made it back on the team this year. They are joined by six rookies who will hit the court at Staples Center for the first time this fall. On Saturday, July 18, 2009 the Minnesota Vikings Cheerleaders joined hundreds of Viking biker fans for the 15th Annual Ride For Life. Despite the fall like, football season weather in July the turnout was phenomenal! All the fans who attended Ride For Life last year welcomed the cloudy, brisk weather this year from last year’s torrential down pours! The Ride For Life is an appearance we always look forward to every year to help raise money for the Vikings Children’s Fund Charity. We rallied for the morning registration, breakfast buffet, and mingling at the Blue Heron Grill in Hugo, MN. We were so thrilled to share our new 2009 – 2010 Vikings Cheerleader calendar with all the fans and feel they were equally as thrilled. It was a fun walk down memory lane as we reminisced with fans about passed Ride For Life events and welcomed fans who joined us for the first time. We even witnessed a fan wearing a “purple #4” jersey. In style, is a way to describe our traditional journey from the registration point up to the Outdoor Amphitheater in Hinckley where all the action was happening! As Minnesota Vikings Cheerleaders, we were treated to a limousine ride and lead the sea of bikers to our final destination. It was such a site to see hundreds of bikers who had already gathered in Hinckley and an honor to cheer with them as we welcomed the caravan of riders from the Blue Heron Grill. Todd, the owner of the spirited Vikings Bike, which you all see on game day zipping out the tunnel, was amongst our favorite bikes there! We had an AB FAB (absolutely fabulous) time enjoying the food, prize giveaways, music from Zed Leppelin, remarks from John Heinz as the emcee with our Viking fans. Everyone who attended the Ride For Life also had the opportunity to meet Vikings Alumni players, including Benchwarmer Bob, and Viktor the Viking! There was a fun excitement in the air as we chatted with fans about the upcoming season and training camp! What a day! We are already looking forward to next year ‘s Ride For Life event. In this installment of From The Archives, I introduce my all time favorite Raiderette, Kelly Morris. These photographs were taken in the mid 1990’s with my old film camera and a 300 2.8 super telephoto lens (you know those big white lenses, the sports photographers use to shoot football games). Back in the “good ol’ days” before 9/11, you could take in pretty much any camera equipment that you wanted…at least that was the case at the Los Angeles Coliseum. Though Raiders fans have a rather surly reputation, safety and security were never a problem in the Coliseum because of the number of uniformed LAPD officers that patrolled the sidelines. In fact, the season ticket holders in the row in front of me, were LAPD. So, I never felt unsafe at the Coliseum, though there was once incident where those off duty LAPD officers spotted a Raider fan with a handgun in his pants…he was promptly escorted out by the uniformed LAPD. But enough of my Raider anecdotes and on to the photos of my all time favorite Raiderette Kelly Morris. The great thing about a Raiders home game was that the Raiderettes mingled with the fans before the game, signing autographs and posing for photos. They were accessible, friendly, and very good looking. You could really get up close and get to know them; it was a very close knit experience. The Raiderettes and their fans were family. Those were the days, back in the 90’s…it was a different time and place. Five Washington Wizard Girls: Jessica, Nina, Samantha, Alexandria and Lyndsay are back from a 10-day goodwill trip to China. Also making the trip was Wizard Girls Assistant Director Brianne who once again donned the WG uniform. The Wizard Girls barely have time to catch their breath. In two weeks they’re off to Tortola in the British Virgin Islands to shoot their 2010 Swimsuit Calendar. The 2009 NFL season is just around the corner, and while the guys are getting ready for pre-season and fighting to make the final roster, the ladies of the NFL have been hard at work all summer long! On The Flipside host Aubrey Aquino knows a little about that, but these days she’s retired her dancing shoes and helping choose which ladies will stand on the NFL sidelines this season. Watch this special Sideline Distraction edition of On The Flipside – making the cut to be a member of the Miami Dolphins Cheerleaders. And helping out on the judges panel and on this special episode are WEDR/99 Jamz personality Lorenzo “Ice Tea” Thomas and Dolphins Alum Shawn Wooden. Check out the highlights from Aventura Mall and see who makes the team!  The Allen (TX) Americans, Collin County’s newest professional hockey club, are accepting applications for the Ice Angels promotional dance team. The club is looking for individuals with skating or dancing ability, high energy, poise, good personality and good overall physical appearance. Ice Angel responsibilities include rehearsals, personal appearances, answering fan mail, children’s dance workshops, performances, interviews and photo shoots. Ice Angels must be fully committed to the position and serve as positive role models. All applicants must be 18 years of age on or before August 8, 2009, and have a high school degree or G.E.D. Also, dancers must reside in the Dallas/Ft. Worth area and have reliable transportation. Ice Angels are required to attend all practices, games and other related activities. Preliminary auditions will be held August 8 from 9:00 a.m. – 2:00 p.m. at Legacy Dance Center in Frisco. The semi-finals will be held August 9 from 1:00 p.m. – 5:00 p.m. at the Farmers Branch Dr Pepper StarCenter. The final audition will be August 15 from 6:30 – 9:30 p.m. at Dodie’s Place Sports Grill in Allen. All interested dancers need to complete the application and waiver located at allenamericans.com and return it to the Allen Americans office with a $20 registration fee (cash or check payable to Allen Americans) and a non-returnable photo by 5:00 p.m. on August 6, 2009. Applications can be mailed or dropped off at 190 E. Stacy Road, Ste. 1508, Allen, TX, 75002. If mailing the application, please put it to the attention of Ice Angels Auditions. To help prepare interested applicants, the Americans are holding audition prep classes led by Ice Angels Director and former Dallas Desperados Dancer BreAnna Foddrill. Attendees will learn choreographies similar to the tryout routine and will practice their introductions that are required at the audition. The classes are designed to simulate rehearsals. The location and dates are listed below. Classes will be held at Legacy Dance Center, which is located at 4040 Legacy Drive #205, Frisco, TX, 75034. The prep classes run from 8:00 p.m. – 9:00 p.m. on Wednesday, July 29, and Wednesday, August 5. Dancers should wear hot pants, bikers or cropped dance pants, a halter or athletic bra top and dance sneakers. They should also arrive with attractive hair and make-up. Each class costs $15. For questions, please call BreAnna Foddrill at 817.889.0948. Auditions for the NETS Kids dance team will be held Tuesday, August 4 at the NETS Practice Facility, 390 Murray Hill Parkway, East Rutherford, NJ. The NETS Kids are presented by LTJ Arthur, the apparel retailer. Registration will begin at 5:30 p.m. and the auditions will start at 6:00 p.m. The NETS are seeking boys and girls ages 6-13 with at least two years of technical dance training. Dancers will be asked to demonstrate their ability to learn and perform choreography. Tumbling and break-dancing skills are a plus, but not required. Participants should wear dance attire and non-marking sneakers or dance shoes. One parent must be present at registration to sign a participation waiver. In advance of the auditions, the NETS will host a NETS Kids Audition Prep Class on Monday, August 3. The class will be held from 6:30 p.m. – 8:30 p.m. at the NETS Practice Facility. Participants will learn actual NETS Kids choreography from the NETS Dancers and receive audition tips from NETS Kids Coach Debra Bisignano and NETS Entertainment Manager Kimberlee Garris. Call 201-635-3147 to register.